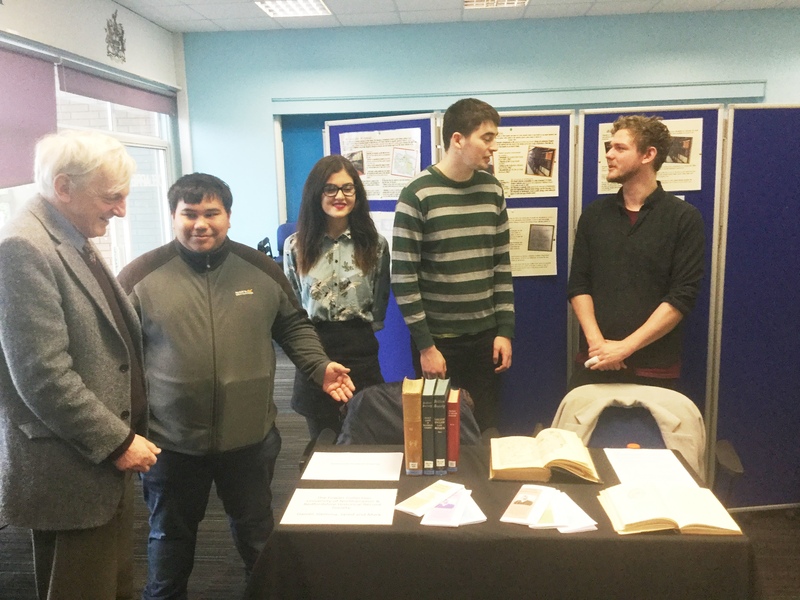 BHRS member James Collett-White and Barbara Tearle visited the University of Northampton on 22 February to view the history students’ displays produced for their employability module. See the post in November 2016 for more on the project. Each group of three or four students from the history department worked on a different archive, contributing to its research or publicity projects. The unifying theme of all the projects was the region around Northampton but otherwise their topics varied greatly. The Fowler Library group were Mark, shown here with James Collett-White from BHRS, Gemma, Daniel and Jared on the right. use of social media for publicity. everyday life in the middle ages as revealed in volumes of the Selden Society series. As a start to implement their recommendations, the group had produced several leaflets. BHRS will continue to work with Northampton University Library to promote the Fowler collection. Contributing to an ambitious project by UoN Students’ Union to renovate a Grade II Listed but disused Engine shed (opens in new window), another group delved into the shed’s history. They drew on printed, archival and material sources to looked at its use over the years and, in particular, why it has been listed. The Shed will become part of the University’s new Waterside campus and be the centre for student activities and events. The posters showing the results of this project will be used in the renovated building. Students completed a project developing more interactive museum displays which will contribute to bringing history to life for the many visitors to this World War II code-breaking centre (opens in a new window). Students experienced the extensive sorting process that documentation from the Foreign and Commonweath Office goes through before it is deposited at The National Archives. As part of the heritage development at Silverstone (opens in new window), students helped to populate the newly-developed app with content which will make the history of British motor racing more accessible to new audiences. This is an archive (opens in new window) of British and international fascist and racist material deposited with the University of Northampton. The history students in this project concentrated on examining themes of extremism revealed through the material. Their display focussed on eugenics and racial stereotyping as found in old illustrations. They felt that these attitudes needed to be publicised so that they would not be forgotten. This page was added on 05/03/2017.